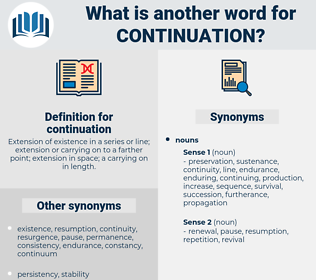 What is another word for continuation? Extension of existence in a series or line; extension or carrying on to a farther point; extension in space; a carrying on in length. stamina, consequence, follow-on, protraction, continuous, Prolonging, contiguity, remainder, persistency, Reappointment, viability. declarations, continuity, continues, extension, prosecution, pursuit. 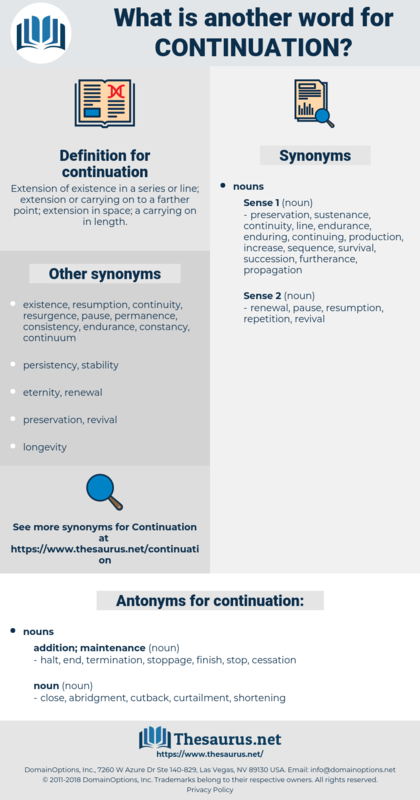 perpetuation, sequel, continuum, pursuance, succession, proceeding, continuity, furtherance, roll-over, permanence, lengthening, wake, extension, permanency, prosecution, successor, expansion, sustenance, completion, pursuit, conclusion, existence, attainment, progress. halt, end, termination, stoppage, finish, stop, cessation. close, abridgment, cutback, curtailment, shortening. And her two daughters - in - law seemed like a continuation of herself. Evening, part - time, and continuation schools offer instruction in agriculture, industry, commerce, transportation, and the professions.